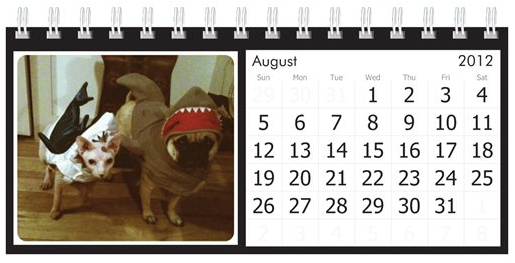 Create your own (nerdy) custom calendar! So I know this is a little early, but maybe it will inspire you to take great photos this spring/summer to incorporate in a calendar later on in the year! 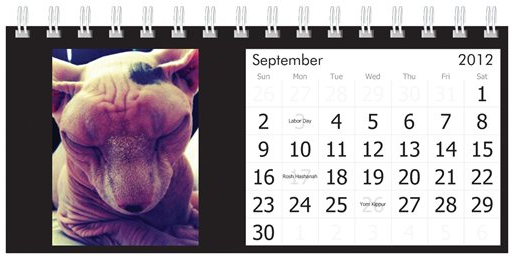 I make a yearly calendar of my two animals – The Ugly Tribe – featuring Leopold (Pug) & Vladimir (Sphinx Cat). 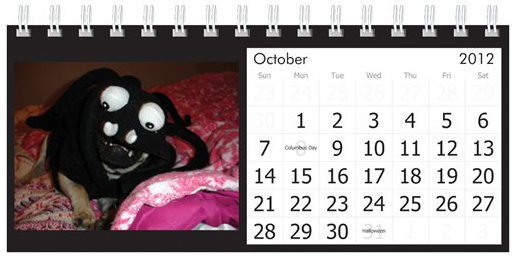 This year I used a professional company to bind and print the calendars and the results were AMAZING. 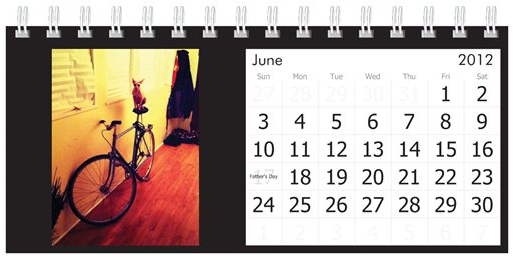 I also chose to use a small desk version to save money and be more unique than the typical wall calendar. But you can decide which type will work best for your project. 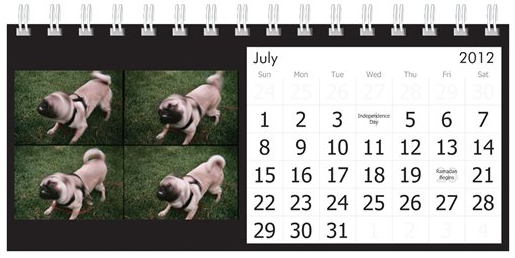 So here are some steps/tips to get you going on your own custom calendar! Pick a topic/theme – I chose my animals of course, but you could pick your kids/animals/knitting project finished photos/flowers/legos… you get the idea. 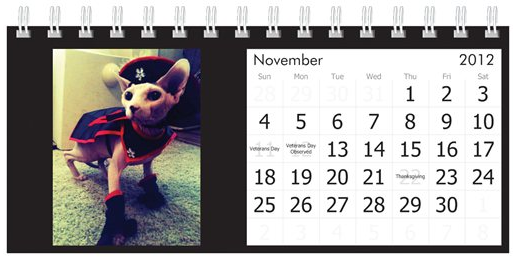 Write an outline – for each month prior to taking a photo write down the things you’ll need (costumes/backdrops etc). 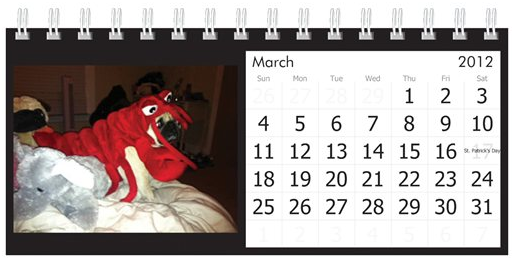 Plan what you want for each month in advance so you don’t have a ‘oh man I wish I had done something else’ moment later on. This will make the process so much smoother – even if you wait till the very last minute to build your calendar. Take LOTS of photos – play with angles, lighting, film speed – this will give you a lot to choose from when it comes time to pick the photos. So my process was fun because it meant dressing up my animals and/or playing with filters on my iPhone app Camerbag to make the photos truly unique and original. 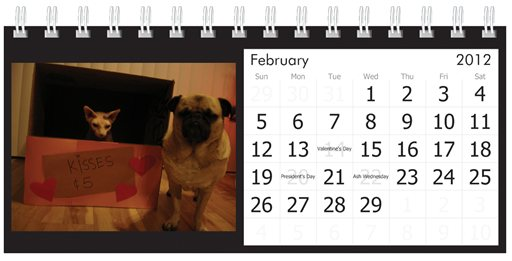 I chose to use Vistaprint to print my calendars – I bound them in the past myself and it was a NIGHTMARE! 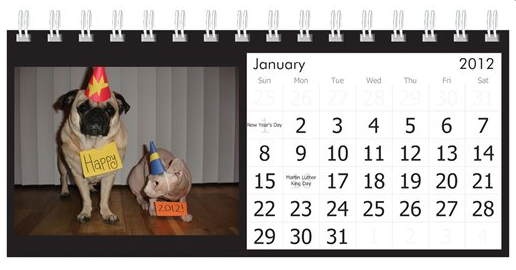 (loads of errors and thus wasted calendars not to mention way way too much paper wasted) Vistaprint has a great online upload tool, but you cannot edit them once you upload them so have them ready. Further I kept getting an error of some resolutions being ‘too low’ I ignored it because I chose a small desktop calendar and knew the photo would not be blurring at that size. You can also upload a mix of .jpegs and PDFs with no issue. 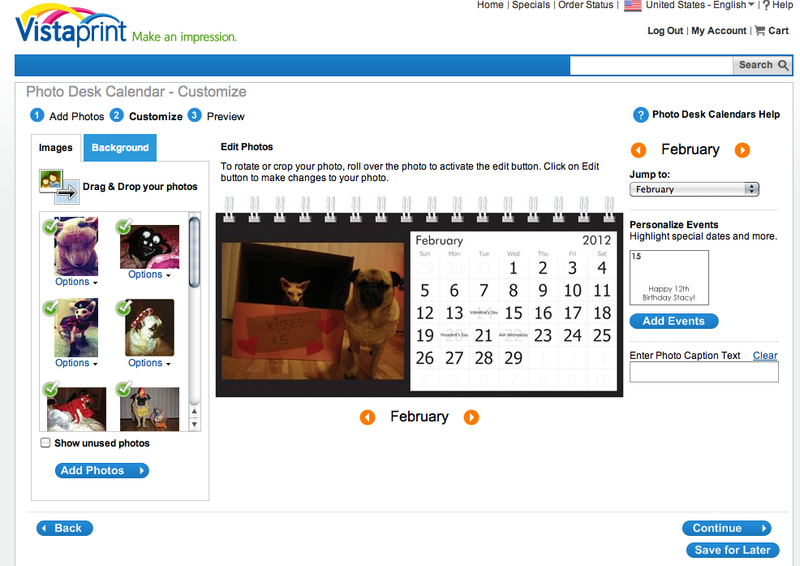 You can even insert text on specific days to remind you or your calendar recipients of special days! Such a simple process. 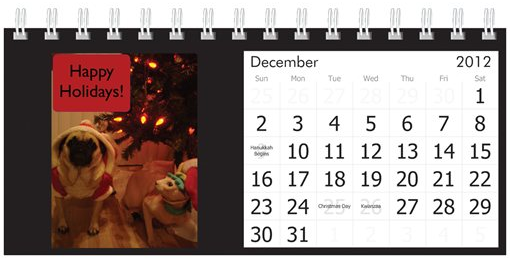 Not to mention that depending on how many you get the calendar is about $3-$4 a piece. Not bad at all considering you can gift them to neighbors and friends/family and it’s a perfect gift. The more you order the cheaper it gets too. 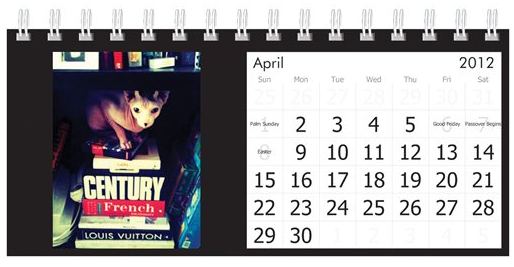 I had price checked in the past at FedEx Kinko’s and the large calendars were around $10 a piece which for 40+ is just way way too much to spend. I hope this inspired you to get started on an idea or plan for holiday gifts – remember if you outline and have a plan you can wait until November to put it all together (like I did!) and it will still arrive in early December and be the highlight gift for your friends and family. 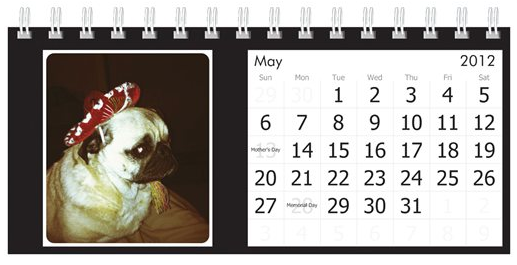 Here are the photos I chose and my calendar.